EKK Group firm City Center Supermarkets and hypermarkets conducting latest walk in interview for hiring Supermarket Staff. Its a free and direct recruitment by the company. * Housekeeping Staff preferably with related experience. * Accounts Executive preferably MBA or M.Com with 3-4 years of experience. * Chef/Cook with at least 3-4 years restaurant experience. * Executive Secretary required to have 3-4 years experience in assisting senior manager. * Inventory Controller preferably with exclusive retail experience. * Marketing Executive with minimum 3-4 years retail experience. * HR Manager with at least 5 years experience as an HR Manager in retail. * Purchase Head must have 5-6 years of hypermarket/supermarket experience. 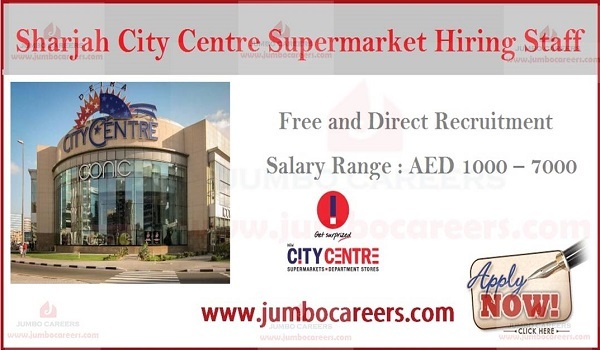 * Store Manager with at least 3-4 years hypermarket experience. * PRO required to have at least 3-4 years similar experience. Location : New City Centre Hypermarket, Mezzanine Floor, Al Sharhan Building, Near Abu Shagara Park, Close Novo Cinemas Buhaira Corniche, Sharjah.